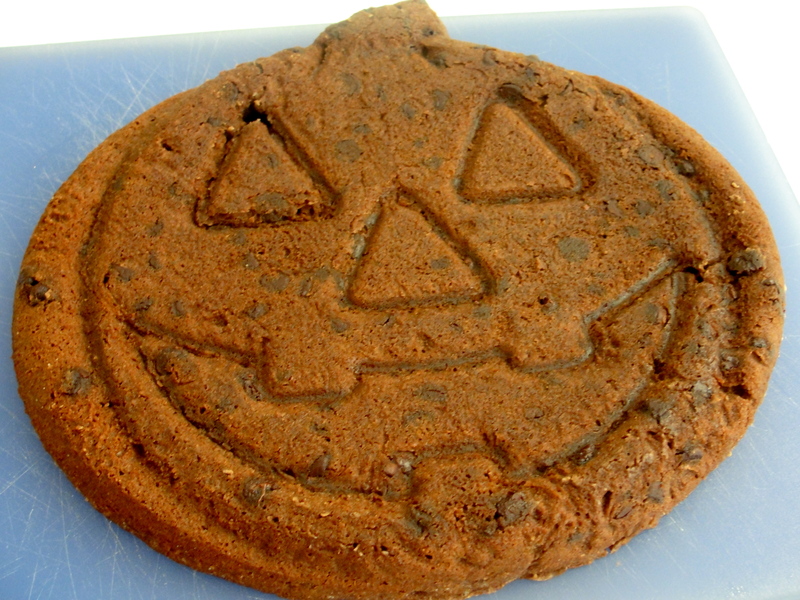 Last year, I scored a fantabulous Jack-0′-lantern cake pan from Freecycle the day after Halloween. It wasn’t until I tried baking a cake in it that I realized why its original owner gave it away to a total stranger. That’s because it’s wide and flat, and trying to turn an actual cake out of it is a losing proposition. Crumble city, baby. This morning, I sprayed the pan liberally with baking spray (basically Pam with flour added into the mix), poured a batch of the world’s best brownies in there, baked them an extra five minutes over what the recipe said, and then let them stay in that punkin’ pan until they were room temp all the way through. And then I slid my biggest cutting board overtop the pan, held it with one hand, and quickly flipped the whole contraption over. Success! He’ll get orange frosting later, but I wanted to show you how well he turned out. I shared a tiny tip about this with you yesterday. Today, though, I’m going to break down the whole recipe, starting with a single pound of ground turkey. That should be a relief from the original recipe, which started with three pounds (or the original-original Barefoot deal that started with five!). Here’s the thing that sparked this recipe: I love barbecue sauce. I love it more than ketchup, more than mustard, and more than any other condiment I can think of. Barbecued chicken is among my favorite meals of all time, and nothing makes me happier than getting all sticky and sloppy-full at Red Hot & Blue, which I happen to think has the best barbecue sauce of all time. I also love meatloaf but rarely make it because I am the only person in my house who feels that way. You heard me. The same people who don’t like roasted chicken also don’t like meatloaf. Who doesn’t like meatloaf? Right? Un-American. It’s just not right. So because DH was away this week, I made myself a meatloaf and converted it to barbecue-style at the same time I simplified the original recipe to get rid of a dirty pan and about four steps. And this delivered such joy to my meatloaf-deprived palate that I made it again a second night. I DIDN’T EAT BOTH. Sheesh. I made the second so I could measure what I was doing to tell you guys about it, and then I sliced it up and froze it for future lunches and dinners. Just for the record. Heat your oven to 350 degrees. Cover a rimmed sheet pan with aluminum foil and spray it with oil or cooking spray. In a large bowl, blend all of the above ingredients together with your hands. Don’t squeeze! Just mix lightly with your fingers until you don’t see any identifiable lumps of breadcrumbs. Put the meat mixture onto the sheet pan and form it into a loaf, about the size of a regular loaf pan (9″ x 5″ if you need a measurement–I eyeballed it). Spread extra barbecue sauce on the top and sides with the back of a spoon. Bake it until the internal temperature registers 160 degrees–it took about 25 minutes in my oven. Let it sit 10 minutes and slice and enjoy. Yee-ha. Warp speed, gang. That’s the only way I can describe life in my house this week. Sports try-outs and field trips and dance class and Taekwondo and tons of work and a sick kid, oh my! So I don’t have a new recipe to share with you quite yet, but I do have two tricks that make some I’ve already posted more fun. Are you on Pinterest yet? Holy addiction, Batman. If you are (and you really should be), you’ve seen all the pins to recipes that incorporate Halloween candy. Excellent idea, especially for the candy corn (any Lewis Black fans? Corn…that tastes like candy! Son of a …!). But if you’ve already tried to bake candy corn onto cookies or other sweet goodies, you’ve learned the lesson I figured out last year. Candy corn melts in the oven. Into nothingness. You wind up with a sad orange dent where you thought the candy was going to be. Fear not–there is a solution. Yesterday, I made a pan of the most amazing brownies on the planet. I chucked in a handful of Ghiradelli chocolate chips that were wasting away in the pantry and baked them up. And then the second (the second!) 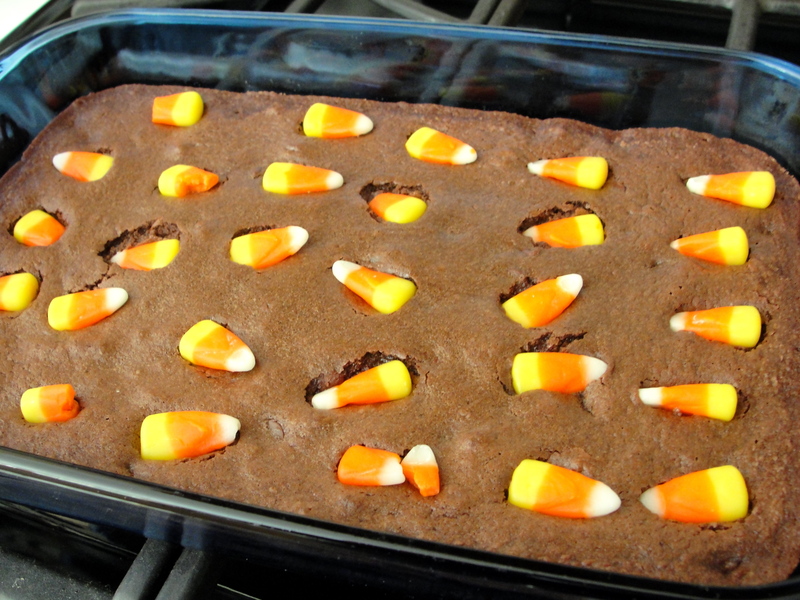 they came out of the oven, I gently pressed candy corn onto the top of their yumminess. This works for brownies, cookies, or cake, all of which are soft and pliable in those first minutes out of the oven. You get a candy-studded goodie and the corn survives intact. Excellent. DH was traveling this week. I miss him when he’s gone, but it’s a great opportunity to enjoy some recipes he’s not very fond of. 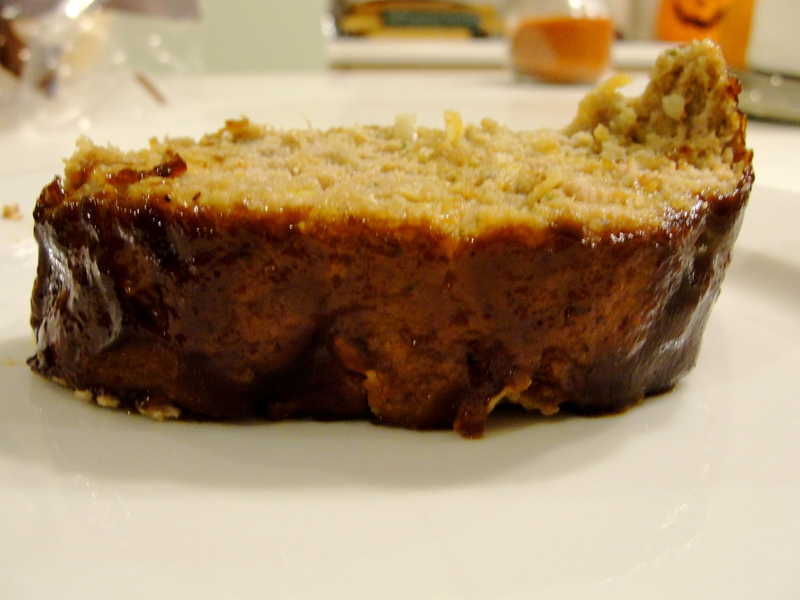 One of those is the amazing turkey meatloaf I shared with you a few months back. I Texas-ed it up a bit, and it was amazing. To do that, add a tablespoon or two or Worcestershire to the meat mixture before you mix it up (I also used dried onion flakes instead of sauteeing onion in a pan, and that worked fine–so there’s a third tip for today!). Mold it into a loaf and put it on a lined cookie sheet, just like before. Only this time, instead of ketchup, use barbecue sauce on top. Barbecue meatloaf. Yum, yes? YES! I had it for two nights with sweet potato fries on the side, and I was a happy single-mom camper. Recipe tomorrow. I promise. Until then, happy tricking! Happy Friday, gang! We made it! We haven’t done Super-Fast Friday in awhile (mostly because I feel like every day has been super fast lately), but I wanted to share this trick I learned from Everyday Italian on the Food Network. Yes, I watch and learn from it, and the food snobs can just shut it because there’s a lot of great stuff for real at-home cooks on that network. We don’t all earn five diamonds or want to spend hours figuring out ingredients we can neither pronounce nor find in a regular grocery store. So I was watching Everyday Italian and heard Giada say she puts Parmesan on her pasta before she adds sauce. Hot pasta goes into a bowl or onto a plate, grated cheese is stirred in, and then hot sauce goes on top. This, she said, gives the cheese a minute to melt onto the noodles, and then the sauce has something to stick to. I tried it, and guess what? The flavor difference is pretty amazing, even to my untrained taste buds. I started cheesing before saucing and have never looked back. Give it a shot and see if you notice a difference. Have a great weekend! Another fly-by, gang. Another week of keeping my head above water, culminating in coordinating a camp-out for 80-some Cub Scouts, moms, dads, and siblings. We’ll talk about that next week–how I shop for that many kids and adults so nobody starves or complains (much). Today, I’m sharing a fiddled-with recipe we all enjoyed. OK, the kids whined a lot about the peppers, which are apparently toxic to those under the age of really old, but I ignore that. *eye roll* DH and I loved it and the kids ate the steak and noodles, and thus it is deemed successful. The four of us ate this for two nights–it’s a lot of food. Slice your steak into strips, about 1/2 inch thick. Sprinkle them with garlic powder and let them sit while you heat up a large skillet over medium heat. Coat the pan with olive oil, lay the strips down, and brown them on both sides–you are not going for cooked here. Only brown on the outside. Remove them to your slow cooker with tongs (no grease, please). Add in your onions and peppers. Stir together the broth and cornstarch to make a slurry. Pour that into your slow cooker, and add the tomatoes, soy sauce, sugar, and Worcestershire sauce. Cover and cook on high for 4 hours or low for 6-8 hours. Serve over rice or egg noodles. Last week, I told y’all about the rockfish DH brought home from a business trip to Long Island. I also told you all about the rice I made to go with it. This is what I did with the fish, and it is so stinkin’ easy that you may never cook fish on the stovetop again. Rockfish is a meaty fish. Our filets are super-thick (about two inches) and eating them is a lot like eating steak. They were perfect for this preparation. You could use a thinner cut, but adjust the time accordingly. You can also use a different kind of fish–this would be great with cod, halibut, or another white fish. In a small bowl, stir together the tomatoes, onion, garlic, and spices and let them sit about 10 minutes. Preheat your broiler (to low if you have a choice). Spray an ovenproof dish with olive oil or nonstick spray–I used a little casserole I got at Ikea a few years back, but use whatever you have that’ll fit your fish in a single layer with not much room to spare. Even a bread or brownie pan would work, but be sure to line it with foil so you don’t get garlic scent in your next batch of baked yumminess. Spoon about a third of your tomato mixture into the bottom of the pan. Salt and pepper your fish as you’d like and lay on top of the tomatoes. Spread the rest of that mixture on top. Set it in the oven and broil it until it’s cooked through–my uber-thick rockfish took about a half hour in the hot box to cook. Remove from oven. Sprinkle with lemon juice and enjoy. DH came through the door last night just as I was slicing up the pizza I’d made. He dropped his keys, leaned over the counter, and grabbed a slice. I smiled and said thank-you, but didn’t tell him the truth, which is that the things that make my pizza good are more about technique than recipe. For the most part, crust is crust and sauce is to-taste and the cheese comes out of the grocery store in a bag, and I don’t do much to doctor those up. But I have tricks up my sleeve that came from a lot of thought about the pizza recipes I tried that were so-so, and the way my local pizzeria makes its pies. Think about what happens when you walk into a pizzeria. You approach the counter and hit a wall of heat, yes? That’s because pizza ovens are screaming, center-of-the-sun hot. And they’ve been that way for hours before you order. Ditto for the pans your pie bakes on–have you ever seen a pizza chef toss dough into the oven on a cold pan? You have not. They prepare the dish on the countertop and use a pizza peel to slide it onto a hot pan. You do not need a pizza oven or a peel or anything else fancy-schmancy to make restaurant-quality pizza. But you do have to follow a few rules and be willing to chuck the recipes a bit. The one thing I recommend you buy is a pizza stone, which you can find for about $15 in your local Target or Wal Mart. Fancy is not on the agenda–cheap is your friend. These are unglazed ceramic and they are magic when it comes to crispy-chewy crusts. My stone lives in my oven all the time (it’s also phenomenal for making bread) so it doesn’t take up cabinet space or need any prep. I never wash it (oh stop–it lives in the oven, y’all, and gets sanitized several times a week), but I do take it out after it cools and scrape it down well with a bench scraper (you can grab one of those for a few dollars at Ikea or Target) before returning it to the oven. I use a rimless cookie sheet as a pizza peel and it works beautifully. You want something dough can slide off. And the secret to that sliding? Cornmeal. You want a good layer of cornmeal on your cookie sheet and on your pizza stone before you bake (right before with the stone–cornmeal smokes up very quickly, so sprinkle it onto the pizza stone seconds before you slide your pie in the oven). Make your dough. My recipe is below, but really, you can use any one you like. The trick with this is to use half bread flour and half all-purpose flour. That bread flour gives the crust protein, which gives you that amazing crispy-chewy quality that your local pizzeria features. I wouldn’t go more than half and half on it, though, or your crust will be too soft. And the other trick with this is to prick the crust with a fork after you’ve rolled and stretched it into a circle, which will prevent the under-sauce part from rising in the oven. See? You want to sprinkle oregano between your sauce and the cheese. 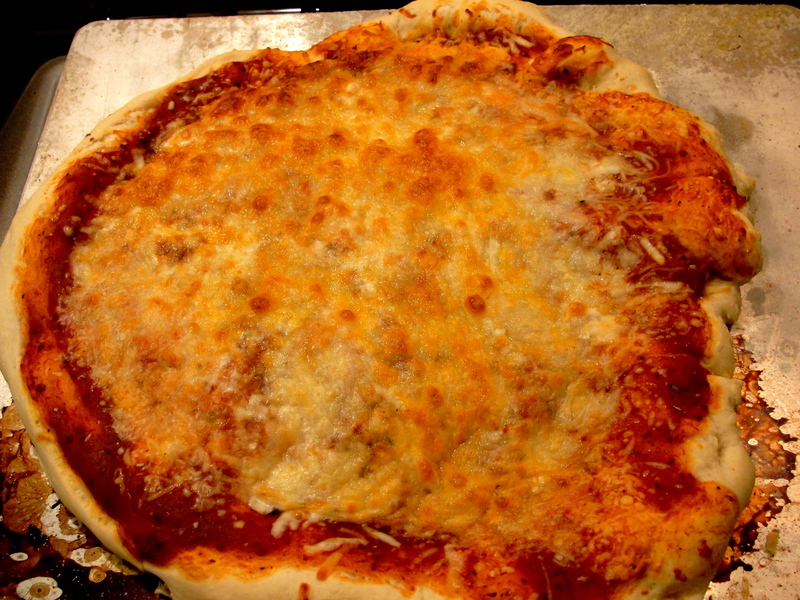 And my final trick is to use a blend of cheeses that, at a minimum, includes mozzarella and cheddar. I said cheddar. Once you try it, you’ll never go back. Promise. 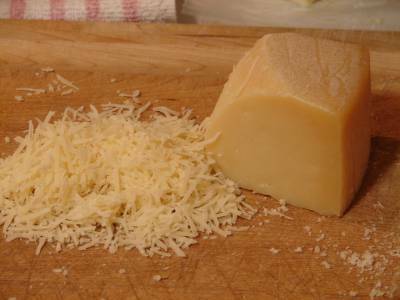 I use an Italian blend of cheeses that includes cheddar and can find that even in my sad Soviet-esque market, so I’m sure you’ll see it too. So. You’ve heated up your oven and stone, made your dough, rolled and stretched it out, pricked it with a fork, transferred it to a cornmeal-coated rimless cookies sheet, covered it with sauce and oregano and cheese and toppings, and slid it into the oven right after sprinkling more cornmeal on your stone. The last thing you need to do is turn on your oven light and keep an eye on your pie without opening the door. You want all that gorgeous super-hot air to stay in there and crisp things up. When your cheese starts to brown–and not before—very carefully use that rimless cookie sheet to slide under the pizza, ease it out of the oven, and enjoy. (Turn off your oven and let it cool several hours before you try and scrape your stone–it takes awhile to reach room temp after this). So that’s it. You’ll enjoy delicious pizza at a fraction of the price of your local delivery shack, and you won’t believe the results. Mix the above together in your bread machine on the dough cycle. If you don’t have a bread machine, mix the ingredients together with a mixer until they’re just blended, then knead by hand for about five minutes until the dough is soft and elastic. Spray a bowl with cooking spray or olive oil, put the dough in there, cover with a clean towel, and let it rise about an hour. 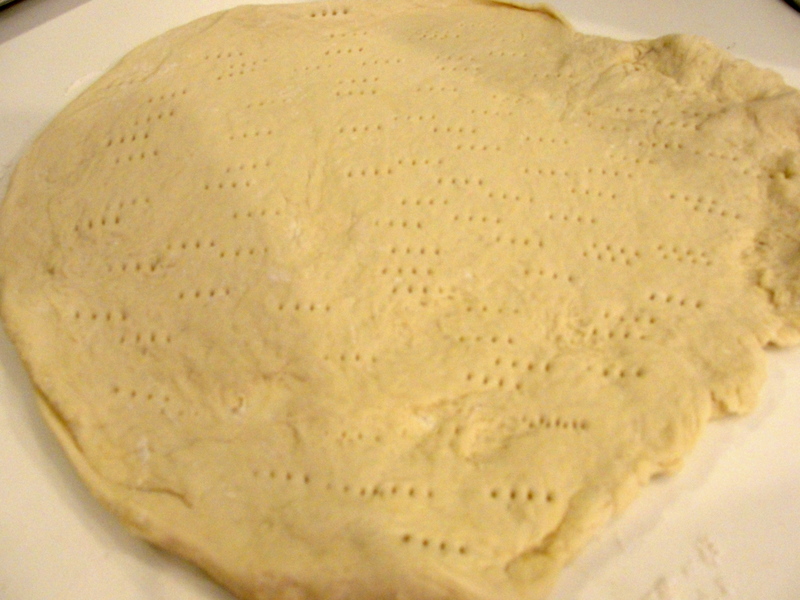 Punch the dough down, stretch and roll it into a pizza circle (make it a bit thinner than you want–it’ll rise again in the oven), prick with a fork, and then follow the directions above to make a pizza.